I will never forget Jim Sill’s keynote from my first GAFESummit. In it he showed a video of the virtual field trip. Through the use of Google Glass, a class of students was taken inside CERN, the home of the Hadron Collider, in Switzerland. They were given a first hand view of the inner mechanics and provided with an adaptive running commentary the whole time. This video was about asking the question, what if we could overcome the challenge of access and availability by bringing a field trip into the classroom? Making it possible to venture around the world (or even universe) and walk the streets of Paris or visit the Great Wall of China. Does this constitute the next best thing to being there or is it something else again? I had a similar such experience recently when I tried Google Expedition for the first time at Melbourne West GAFESummit. A combination of Classroom, Cardboard, Street View and Photosphere, Expedition provides viewers with a choreographed 360 degree experience. It involves a collection of Cardboard devices connected to a central tablet via a network connection. It does not require the internet. Featuring everying from the Mars to the Great Barrier Reef to the Seven Wonders of the World, the app takes the viewers on a journey, providing a prescribed commentary for the teacher to present all along. It provides the means for the teacher-as-guide to focus attention on something by circling on the screen, rather than have the class lost in the experience. Vocabulary – Robert Marzano suggests the best way to build academic vocabulary is through real life experiences, such as field trips, but then says that this is not always feasible. I wonder if Expedition and Cardboard make this more possible? The opportunity to move around in a foreign space and build up vocabulary at the same time? And what about EAL/D students and newly arrived migrants. Not only could we introduce them to new places, but they too could share a part of their world by taking us back to where they may have travelled from. A priceless experience when building empathy. Real Life Problems – Sitting above the Taj Mahal provides an opportunity to explore the subjects of culture and engineering first hand. Or while climbing El Captan in Yosemite National Park, we can discuss why the only thing growing on the cliff face is a cactus. Narrative and Storytelling – Although Expedition comes with a prescribed script, what interests me is the ability to write your own story as you go along. It provides the means to make predictions and provide explanations about what might be happening. Taking this a step further, I am intrigued by the possibility of students being the guide, providing am opportunity to really develop their speaking and listening skills. Sparking Curiosity – Building on the idea of narrative, I see the possibility for students to ask questions and really drive their own inquiry. Google Cardboard is a fantastic hook for learning. I think that children in both primary and secondary settings would find using the glasses an engaging way of encountering a topic – but for me the real potential for success lies in the learning that would take place after the viewers have been used. So what about you? What have been your experiences with Expedition and Cardboard? What do you see as it’s future? As always, comments welcome. Google Maps Treks – A link to the various treks around the world, including places like the Angkor Wat and Petra. (Un)folding a virtual journey with Google Cardboard – Clay Bavor provides an update on the take-up of Google Cardboard. Best VR Apps To Try With Google Cardboard – Ryan Stone provides an overview of the apps that are available for Google Cardboard. A list of all available Expeditions – A curated list of all the available Expeditions. Weekly Teacher Tips for Using Google Expeditions in the Classroom – A weekly set of tips provided by Google around the use of Expeditions. Tool Review: #GOOGLEEXPEDITIONS Virtual Reality App and Getting Real? Google Cardboard and Virtual Reality in Education – Bill Ferriter and Ronnie Burt provide reflections on Google Cardboard and the virtual reality experience. 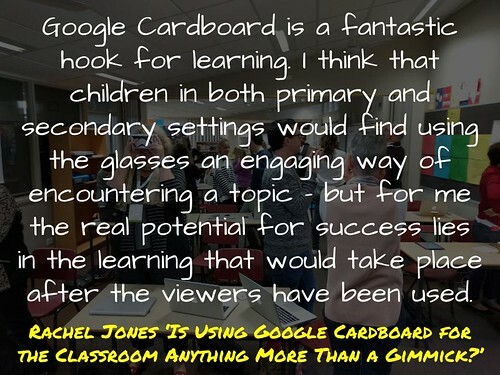 Is Using Google Cardboard for the Classroom Anything More Than a Gimmick? – Rachel Jones provides a useful critique of Google Cardboard and questions what it has to offer. Virtual Reality is not just another #EdTech toy – Richard Wells shares how VR is making a difference in his school. How #VR Storytelling could help schools – Richard Wells provides a summary of activities and actions associated with VR. An Expedition into @GoogleCardboard by Aaron Davis is licensed under a Creative Commons Attribution-ShareAlike 4.0 International License. At the moment we are fixing up our wireless connections and updating our iPads and equipment … I am looking forward to investigating google classroom things with the kids and can see so many ways to use the virtual reality tools. Agree Anna. I think that Cardboard is one of those areas that has great potential. @mrkrndvs we use a plastic version of cardboard. We have a class set that is getting a fair bit of use. I found the cardboard experience interesting but think the jury is still out on its contribution to learning. Worth watching and like all tech casting a critical eye. Agree John, a topic worth watching, critically as always.